The body of Tonderai Ndira was found this week, the 43rd Zimbabwean opposition activist to die in violence since elections in March. Journalist Farai Sevenzo looks back at his life and the circumstances leading up to his murder. 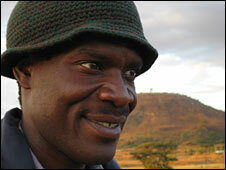 Tonderai Ndira lived in the desperately poor township of Mabvuku and Tafara, east of Harare. He was no stranger to the Zimbabwean police and at one stage had 38 charges levelled against him, ranging from "political nuisance" to attempted murder. He was one of a group of young men and women, barely in their thirties, who formed the backbone of the opposition's ranks. 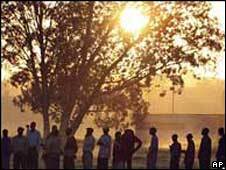 Theirs was the thankless and arduous task of mobilising moribund, disillusioned and tired folk to believe in this new concept called change and to sign up to the messages of the eight-year-old opposition - the Movement for Democratic Change (MDC). On election day, 29 March, the tall and charismatic Ndira was hanging around by what passes for shops in his sewage-ridden constituency, where electricity is erratic and where cholera has already claimed lives in the last 12 months. I asked him what he felt that day would bring, and if, given the history of elections in this country, the day would make any difference. "It is clear that the change we were waiting for is here. If we do not get it, the people must rise up and fight for their victory," he said. Rising up and fighting for victory pits one against the awesome strength of the security machinery the state has at its disposal. That is an undisputed fact in the history of this country's opposition. It is an impossible task. In the weeks following polling day, a campaign of intimidation was unfurled which largely affected opposition people rather than ruling party folk. Huts and houses were torched on both sides of the political divide; images of the beaten and tortured were wired around the world, and diplomats based in Harare collected eyewitness accounts of the horrors being unleashed in the countryside by people variously described as war veterans, militias or soldiers. 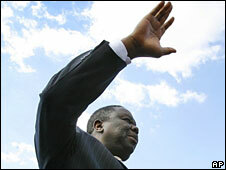 It was with this background that Tonderai Ndira continued to lend his leadership to the idea of democratic change, and his activism went beyond the politics of the MDC. An official from human rights organisation ZimRights, who declined to be named, outlined what Ndira meant to civic society in and around Harare. "I knew him personally, he was a youth activist who went around the country holding workshops and teaching people their rights. "He was very active in the Combined Harare Residents Association - campaigning for things like better streets, more rubbish collections, healthy water supplies. "And so he became a target for the Zanu-PF, because they are targeting active members." And why would such people become targets of the ruling party? "They know that if people like Ndira are removed, there will be less likelihood of an uprising." Ordinarily it was a mission to find Ndira. He would venture into the centre of town for the odd demonstration and then disappear for days on end. His wife and three young children became used to the idea of him coming home after weeks away because a healthy sense of paranoia was needed to avoid spurious charges and lengthy stays in remand prison. But on Tuesday 13 May, according to his friends and eyewitnesses, Ndira came home and slept the sleep of the exhausted in Mabvuku township. At around 0645, a pick-up truck packed with 10 men arrived on his narrow street and drove past his house, stopping at the neighbours. The 10 men were armed with revolvers and AK-47s - some of them wore masks. The neighbour's child duly told them the right address and they reversed, disembarked and told Ndira's wife they were looking for her husband. The presence of so many armed men frightened her into calling out his name and announcing that there were people there to see him. He answered with a voice drunk with sleep and asked her to tell them to come by later, as he needed his rest. He was abducted in his underwear, in front of his young children as they were heading to school and beaten into the truck until he was bleeding. In the ensuing week, his family and friends desperately tried to locate him. The omens were not good, several activists had been found dead and funerals were happening throughout the city and the rural areas - all connected to Zimbabwe's protracted political impasse. On Wednesday, the MDC went to claim two more bodies from Harare's Parirenyatwa Hospital morgue. Party officials were told by the mortician there was another body that had not been claimed. This new body was badly decomposed; a pair of bloody shorts was plastered to a face clearly broken and shattered. "We only knew it was my brother by his distinctive ring, his bangles, and his unmistakeable height," said Cosmas Ndira, as family and friends filled his small home to mourn his passing before his funeral, which is yet to be finalised. "His jaw was shattered, his knuckles broken, a bullet hole below his heart, many many stab wounds and a large hole at the back of his head which seemed to have been caused by a hammer." Jimmy Chidakwa, a colleague and fellow activist, struggled to contain his anger both at the assassins and his party's leadership. "They are cowards, all of them. Ten men to take down one unarmed man. "And where are our leaders? Out of the country." Cosmas chipped in: "Yes, we are like chickens waiting for the knife to reach our throats. "Given his position in the party, my brother should have had more protection. "I know so many people now too frightened to vote with their hearts come the run-off." Unlike the opposition leadership, who are not here and have been at pains to tell the world of diplomatic efforts under way as they travel - to Botswana, South Africa, Kenya, the UN headquarters in New York - the foot soldiers like Tonderai Ndira remained on the ground, visiting the injured, co-ordinating relief efforts to the displaced. The opposition may yet feel the full force of the loss of such urban activists in the weeks to come as the country heads for the presidential run-off on 27 June.